Looking to hire a freelance SEO consultant to help with your online marketing efforts? 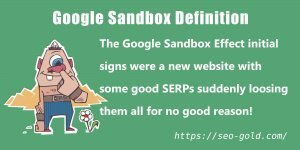 I don’t want to waste your valuable time and hate to waste mine on SEO quotes to those not suitable for the service, so first things first I’m going to scare many of the people reading this away. I work on a monthly retainer fee of no less than $2,000 per SEO client. I work with five or six clients at a time and I’m VERY selective with who I work with: I love to work on interesting projects. There’s no minimum SEO contract period, however it is recommended to budget for at least 6 months to gain the most out of the service. In brief, SEO clients email questions about almost anything related to their websites SEO, online marketing campaigns, social media accounts or basically anything which could have an impact on rankings. Using my extensive SEO knowledge and research skills acquired over the past 15+ years of working in online marketing I answer those queries in a reasonable time frame. Setup and manage dedicated servers. Install pretty much anything required to run a website. 10+ years WordPress experience: WordPress is my preferred Content Management System (CMS). Created multiple WordPress SEO plugins and WordPress SEO Themes. 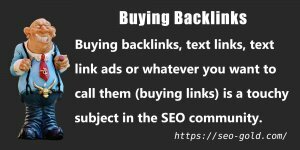 Generate backlinks including viral link campaigns. Create/manage major social media accounts. 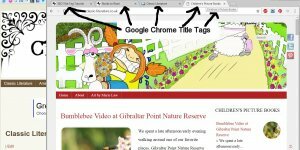 I’ve a science background (studied genetics at University) and have setup hundreds of SEO tests to confirm what does and does not work. I do NOT rely on what others have posted in webmaster forums: I’m afraid you can not trust most of the SEO information posted online, there’s too much SEO misinformation, myths and guess work presented as facts to wade through! 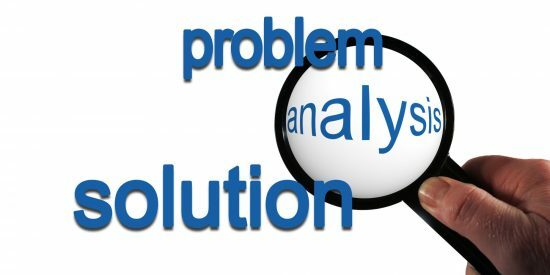 If you have an SEO/SEM related query I either already know the answer or can find and present a solution in an understandable format. 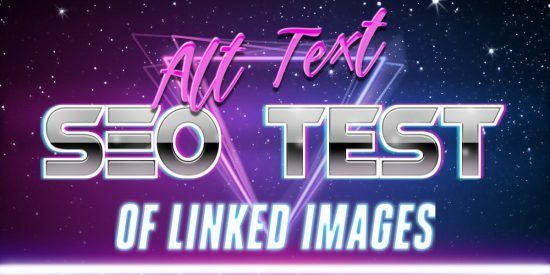 Detailed SEO information can be overwhelming if presented in bulk, I try to match both the technical detail and amount of information to each SEO client. 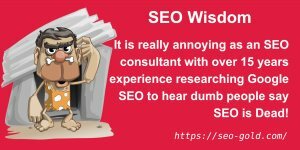 I’m happy to deal with an enthusiastic new graduate with very little SEO knowledge, but a willingness to learn through to highly experienced/skilled members of staff who require advanced SEO guidance. I also share clients content over social media networks as part of the service (no extra cost) and this can generate direct traffic and organic backlinks. 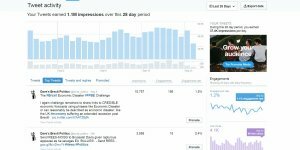 I currently manage a couple of dozen Twitter accounts (in different niches) with tens of thousands of followers generating millions of impressions each month. 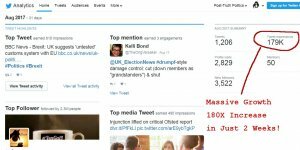 SEO clients new content is Tweeted/Shared/ReTweeted as part of the service. I recently created a new Bitcoin Twitter account just in case I take on a cryptocurrency relevant SEO client. 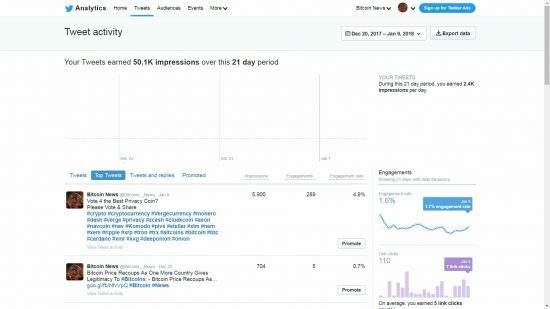 On January 9th 2018 the account was only 21 days old with ~2,000 Followers and below is a screenshot of it’s impressions over those few weeks: just over 50,000 impressions. 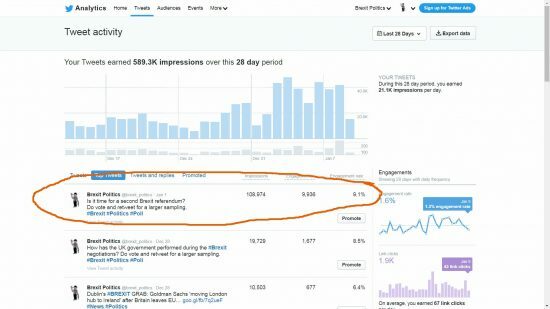 As you can see in the screenshot above it’s generating a decent impression number for a new Twitter account and this is nothing compared to Twitter accounts which are only a few months older. The top Tweet with 5,900 impressions was Tweeted yesterday and I haven’t ReTweeted it (seeded for a greater reach) over multiple other Twitter accounts yet. 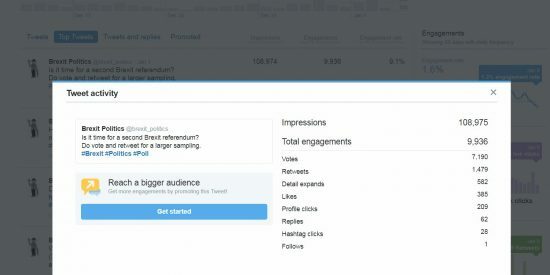 Another Tweet on a different account (politics with just under 10,000 followers) generated over 100,000 impressions over the course of a week. The above Tweet was ReTweeted over 1,400 times organically: I seeded the ReTweets over half a dozen accounts and the rest is viral. As one of my SEO clients that could be a Tweet related to your business. If I take on a cryptocurrency SEO client I’ll share their content on the Bitcoin Twitter account as part of the SEO service. Sometimes a promoted Tweet will go viral, other times it won’t. 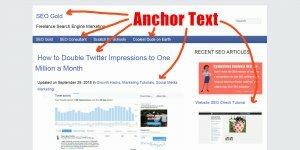 SEO budget of above $2,000 a month. Looking for a long-term business relationship: I’ve worked with some clients for over 5 years. 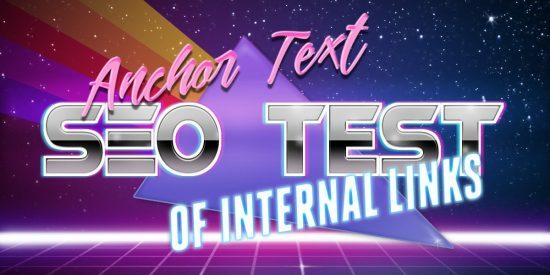 Have at least one employee with the skills** to enact technical SEO advice. **Hands on work where a client lacks the technical know how to make a change etc… is at a rate of $80 an hour, though when I give advice I’ll try to include solutions like code for no charge: this might be a code snippet or even a customised WordPress plugin (if a WordPress user) to achieve an outcome. The perfect SEO client either already has a decent amount of quality content or are working towards creating new content: there’s not much point hiring an SEO expert for a basic 5 page website, without content a site is highly unlikely to generate a ROI on a high-end SEO service. 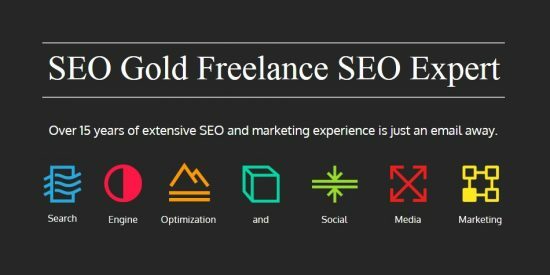 If you are a good fit for my SEO service please contact me at davidlseo@gmail.com with information about your website needs and I’ll get back to you. Please Note: There’s no guarantees with search engine optimization, all I can guarantee is I won’t take on a client I don’t believe I can help (ROI).